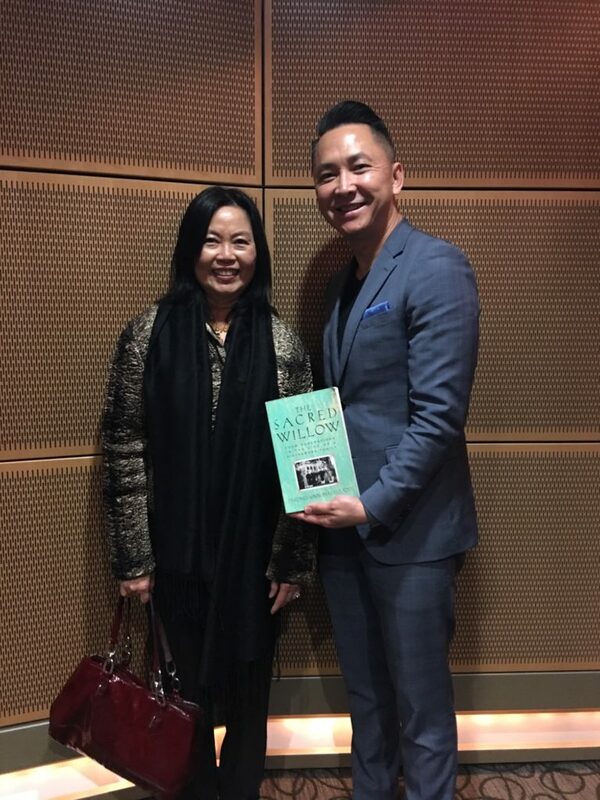 Friends of the Claremont Library and the Center for Asian Pacific American Students at Pitzer College (CAPAS) hosted Viet Thanh Nguyen in conversation with Claremont author and historian Mai Elliott. Lanore P.: If you would turn off your phones so that we don’t have little interruption during the course of this. I’m Lanore Pearlman, president of the Friends of the Claremont Library, which has sponsored this On the Same Page community read for 12 years now. This is our 12th year. If you live in town you’ve probably seen lawn signs for most of those years as they are sprinkled about. Lanore P.: This year we add our thanks to Pitzer College, which has provided this lovely theater, as well as the office of advancement, and especially to Linda Lam and her team from the Center for Asia-Pacific American Students, and for all their aid and comfort. You are comfortable there because of them. Let’s give them a hand. Lanore P.: Just to get an idea about our audience today, if you are a member of the Friends of the Claremont Library, would you raise your hand? If you are not and want to become one. Out in the lobby will be these envelopes, you can take them, or you can fill them and give them to us, but we’d love for you to become members. If you are in a book club, which is one of more than 30 book clubs in our community, please raise your hand. Lanore P.: We have discovered that book clubs have provided our most constant readers from year to year. If you are a student, faculty or staff at the Claremont Colleges, would you please raise your hand? All right. I know that some of you are reading The Sympathizer as we speak. Welcome. Welcome to all who are here. Just a couple of announcements as you saw as you walked in. Please no food or drink in the theater. Refreshments will be provided in the foyer at the conclusion of the program. Lanore P.: This event is being recorded, and will be available to view. Books by our speakers are provided by the Huntley Bookstore, and will be for sale in the lobby for book signing after the program. The final event from On the Same Page will take place at the Claremont Library in the meeting room two weeks from today, March 16th at two o’clock. It will be a celebration of new refugees in our community, featuring Claremont City Council member Jed Leano who is an immigration attorney, who is going to comment on the state of refugee relocation here in California. Lanore P.: We will also share stories, some marvelous food, including I understand balaclava and make some new friends. You are all invited to attend. To conclude I would like to point out a recent example of the national importance of Professor Nguyen. This is the cover of the double issue of the TIME Magazine published last November, with his article headlined on the cover. Who Gets to be American? Who indeed? Now I’d like to invite Rose Ash, long time On the Same Page committee member to introduce our speakers. Rose Ash: Good afternoon. Thank you Lanore. It is my pleasure to introduce our guest today. I would like to begin by introducing the distinguished professor and Pulitzer Prize winning author Viet Nguyen. Professor Nguyen was born in Vietnam and raised in America. He presently holds the Aerol Arnold Chair of English at the University of Southern California, where he teaches English, American Studies, and Ethnicity, and Comparative Literature. Rose Ash: As a literary scholar and writer of fiction he has crafted a nuanced portrait of the Vietnam War. His novel The Sympathizer is a New York Times bestseller and won the Pulitzer Prize for fiction. Other honors include the Dayton Literary Peace Prize, and the Edgar Award for the best first novel from the Mystery Writers of America among others. Among his other books is Nothing Ever Dies, Vietnam and The Memory of War, finalist for the national book award in nonfiction. Rose Ash: Most recently he has been the recipient of fellowships from the Guggenheim and the MacArthur Foundations. In conversation with Mr. Nguyen today is a claimed Claremont author Mai Elliot. Miss Elliot was born in Vietnam and grew up in Hanoi and Saigon. She and her family were displaced by war in Vietnam three times, and her family became refugees for the fourth time when they fled Saigon in April 1975. Rose Ash: Ms Elliot is the author of the Sacred Willow: Four Generations in the Life of a Vietnamese Family. A personal and family memoir, which was nominated for the Pulitzer Prize. Her second notable book, RAND in Southeast Asia: A History of the Vietnam War Era, chronicles of think tanks involvement in research about the Vietnam War at the behest of policy makers in Washington, and the impact of its involvement on RAND itself. You may recognize Miss Elliot as having been featured in seven of the 10 episodes, PBS Ken Burns’ documentary film series, the Vietnam War. She has also served as an advisor to the filmmaker on the series. Rose Ash: Please give a warm welcome to Viet and Mai. Viet Nguyen: Thank you so much to the Claremont Public Library for inviting me, for selecting The Refugees. Thanks to all of you for braving the weather and coming out here. It’s such a pleasure to be here in Claremont for the first time speaking actually, and really just an honor to be here with Mai Elliot, whose work … I’ve known her actually for a very long time. You work with the RAND Corporation, I think I read some of the studies when I was a student many, many years ago, and it was always on the back of my mind when I was writing The Sympathizer. There was actually a plot idea that I had about the RAND corporation. Viet Nguyen: Yeah. I thought, my narrator, the spy, when it comes to the United States, Southern California in the 70s. He has to get a job. I thought, “Maybe he should get a job with the RAND corporation or something like it.” It didn’t work out, but I was hoping to have a chance to satirize the RAND corporation. It just didn’t happen. I really love the Sacred Willow, really really recommend it in case you haven’t had a chance to read it yet. Now you have the opportunity here with Mai Elliot to have a conversation with her as well about this marvelous book. Viet Nguyen: Thank you for being here. Mai Elliot: Well, thank you for being here. It’s really a pleasure to meet you and to converse with you today. I’d also like to add my gratitude to the library and the organizing committee for holding this event today and for you all to come like Viet said even though it’s pouring rain out there. Anyway, since we only have about 45 minutes to talk about the subject of refugees, especially Vietnamese refugees. Let me just plunge into this … Shall I just give a brief history of the movement of the Vietnamese refugees? Mai Elliot: What happened was, in 1975, in April of 1975 when south Vietnam fell suddenly, the United States evacuated a total of 130,000 people whom they deemed as vulnerable to communist reprisals. 7,000 of them were airlifted out in the last 18 hours of the war by a helicopter, in the biggest airlift by a helicopter in history. Anyway, after that the economy of south Vietnam collapsed due to the US embargo, due to misguided policies by the communist government and the legacy of war. Mai Elliot: Also communist repression became intensified. That drove a lot of people to flee and they became known as boat people. They would flee in rickety boats that were not seaworthy at all, overcrowded. They became prey to sea pirates from Thailand in one of the story, you talk about that. Then their boat capsized in the storm and so on. The UN High Commissioner of Refugees estimated that somewhere between 200,000 to 400,000 refugees died at sea, nobody knows the exact figure. Thousands of them became prey to Thai pirate attacks. Sometimes the pirates would attack three times a day against the same boat. The pirates robbed the refugees, killed them, sank their boats, raped them, abducted women and girls. Mai Elliot: With that as a background we will talk about the refugees. By definition a refugee is somebody who has gone through trauma. I remember reading that your family fled when you were four years old. When the communists first attacked, first carried out their final offense in South Vietnam, they attacked a town called Buon Ma Thuot in the central highlands in the middle of the country, the mountain region. That’s when your family fled. Do you remember anything or did you understand what was going on? Viet Nguyen: Well, I don’t remember anything. I think my memories really begin, as memories as a whole story once I came here to the United States as a refugee. I just have images before March, or April 1975, and I have no idea if they are even real, or whether they are just part of my imagination. My family had a very dramatic refugee escape story. Just about everybody had one of the Vietnamese American, Vietnamese refugee community. Sort of like your family my parents were refugees more than once. They weren’t refugees four times but they were refugees twice. Viet Nguyen: In 1954 when the country was divided into north and south and my parents fled from the north to the south, and then again in 1975. It was of course an experience that was deeply traumatic for my parents, and to that extent was traumatic for me too, because their trauma was passed onto me, and I grew up in a Vietnamese refugee community in San Jose California, surrounded by Vietnamese refugees. All of them had gone through some kind of horrible experience to get to this country. Viet Nguyen: Actually for all of us it was normal. We didn’t know anybody who didn’t have a terrible experience. That just became a part of the fabric of life, it didn’t mean it wasn’t difficult. It just meant that we would normalize these kinds of experiences and everybody coped with them a little bit differently. In my case, my memories began in a refugee camp Fort Indiantown Gap, in Pennsylvania. Viet Nguyen: These 130,000 people who came to this country were put into one of four refugee camps and that was ours. That’s where my memories begin, being taken away from my parents, because in order to leave one of these camps you had to have a sponsor, an American sponsor take you. Typically, they would take the entire family but for whatever reason, to this day I don’t understand what happened, no sponsor would take my entire family. Viet Nguyen: One sponsor took my parents, one sponsor took my 10 year old brother, and one sponsor took four year old me. That’s what I remember. That’s the beginning of memory for me. Of course, it was a traumatic experience when you are four years old to be taken away from your parents. It was being done benevolently because the idea was to help my parents get on their feet again, but when you are four years old you don’t experience it that way. Viet Nguyen: I remember howling and screaming being taken away from my parents. I have a son, when he turned four about a year and a half ago. It made me relive that entire experience. Seeing it through his eyes and realizing that it was not just horribly painful for me but horribly painful for my parents as well. That separation was only for a few months, but for a four year old it felt like forever. That for me was what being a refugee meant. Mai Elliot: For me too, the first time it happened I was too little. I didn’t even know that it had happened. The second time, certain, very vivid images stayed in my brain but I didn’t understand what was really going on. Later on as I got older I began to hear more, see more, understand a little more. I’m not surprised that you felt the trauma but you didn’t go through it. Viet Nguyen: Do you think that shaped your life, those experiences of being a refugee? Mai Elliot: Yes. It was difficult because certainly the ground was cut from under you, and my family had to start over again and over again, and over again. On the other hand it made you stronger. My attitude is if nobody is shooting at me I’m okay. Mai Elliot: My first question, it has to do with the memory of the trauma that we talk about. In your first story, which I thought was very well written, really moving. It’s a story for a woman, a ghost writer who is still haunted by the ghost of her brother who protected her from being raped by Thai pirates, but she kept seeing his ghost and the mother too kept seeing the ghost. Mai Elliot: Can you discuss this traumatic experience? Did you meet other refugees who went through this experience of having been victims of Thai pirates? Viet Nguyen: Well, I think that … Yes, I mean, most of the people I knew came in two waves. Either they were a part of this wave of April 30th 1975, and they happened to be part of the elite, most of them, the military political elite. My family was a part of that, except we just got lucky. We were not a part of any elite. We just happened to get lucky and get on a boat and get out of Saigon. Viet Nguyen: The other portion of the refugee population that I knew of went through these boat experiences. I never asked them what they went through. Why would I ask them? I know that they went through something horrible, because I’ve done the research as you did and knew these stories and knew these statistics. I didn’t wanna inquire. That was part of what it meant to grow up in a refugee community, to know that there were all these traumatic experiences that were happening. Viet Nguyen: Sometimes people would talk about them, and sometimes they wouldn’t. I would never want to ask, because who knows how horrible the things might have been, and why rewake them? I also grew up with this knowledge that ghosts were real in Vietnamese society. Their ghosts were real even before they became refugees. They are part of Vietnamese lore and we believe that the dead come back and visit us. In that sense ghosts are not necessarily bad. Ghosts can be benevolent visitations. Viet Nguyen: I wanted to explore both these dimensions of the ghost as a benevolent visitor, but also the ghost as a sign of haunting by the past. It seemed to me in this Vietnamese refugee community, that we were haunted by the past. Whether or not they were really ghosts, they were figurative ghosts that were just as powerful. To me it seemed like so many people had not gotten over the past, would never get over the past. The ghost was a figure for that. Viet Nguyen: I wanted to write a short story where that was simply a part of the narrative. It was a very difficult story to write. I think just as it is difficult to live with ghosts, or to be traumatized for a writer to deal with the past can also be very difficult. That opening story, black eyed women, which you’ll read in about 20 or 30 minutes. It took me 50 drafts over 17 years to write that story. Viet Nguyen: It was the first story I started writing. It was the last story I finished writing. I think it was partly because it was really difficult to write short stories, but also it’s really difficult to address these ghosts of the past. As a writer my challenge was how do you represent a ghost? How do you make the ghost move and talk? It was just very very challenging to try to imagine how this ghost would appear in someone’s life. Mai Elliot: In order to move on after a refugee came to America for example, and resettle, a refugee has to forget the past, because a refugee doesn’t want the past to hold him or her back. When I was doing a promotion tour with Ken Burns for his documentary, I did about 10 of his tours. We showed once the clips to a Vietnamese-American audience. At the end some young people came up to me and said, “You know, my parents never talk about what happened to them in Vietnam. I don’t really understand them because I don’t really know what they went through. Maybe this film would open doors and we can talk about it.” It’s not that their parents have forgotten, they just have to move on. Viet Nguyen: I think that’s true. It’s so individual. There are so many people I’ve met who are like that where they don’t talk about the past, the parent or the children. It’s compounded by language. That the children who are raised here, many of them don’t speak Vietnamese, or the Vietnamese they speak is very limited. Viet Nguyen: For example, when I grew up, the only things I spoke about with my parents were religion, food and education. That was it. How am I supposed to talk to them about these horrible things that might have happened? I had to wait for the stories. My parents would tell me some of these stories, and they were all bad. I just associated Vietnam with trauma. We hope that stories like Burns’ documentary or this fiction or your book would open these kinds of doors, but I don’t know. I’m not sure that that’s always the case. Sometimes it does happen, sometimes it doesn’t. Viet Nguyen: The people who’ve lived through this traumatic experience of the past, some have gotten over it, but many have not. I’m not even sure what to get over the past means. I think a lot of Vietnamese-Americans of that generation, some of them have succeeded here in this country. We have all the trappings of material wealth and they become model minorities and all that, but many of them have not. There is a tremendous amount of poverty and alcoholism and abuse, and all these kinds of things that happen in the Vietnamese community that we don’t talk about in public, but totally exist. Viet Nguyen: I saw all this when I was growing up in San Jose. I don’t know that they’ve gotten over the past. I think collectively we’ve put on the face to the public, at least to the rest of the United States that we’ve moved on and we become citizens and we become a part of this country, but I look inside the community, I look inside families. I don’t see that happening all the time. Viet Nguyen: Not far from here in Orange County in Little Saigon they haven’t gotten over the past. They’ve made a public display of hanging on to a particular notion of south Vietnam, which is a traumatic notion of south Vietnam. It’s a proud notion of a militarized south Vietnam, but it’s one that’s defined completely by the fact that they are still locked into the trauma of losing their country. It’s very difficult to think that the community, or large portions of the community have actually gotten over the past at all. Mai Elliot: That leads me to the next question, the complexity of the Vietnamese refugee community. There is class divisions, there is wealth division. You addressed that in one of your stories about the woman who was going around collecting money, practically extorting money from business owners to finance a fantasy of taking back south Vietnam from the communists by military means. Like you said, there are people who are still fighting the war. They can’t accept that they lost to the communist, because it’s such a difficult thing to accept that they lost their country. Mai Elliot: Can you address that a little further about the division within the Vietnamese community politically, religiously too? There are Catholics, there is Buddhists. It’s a very complex situation. Isn’t it? Viet Nguyen: Yeah, and that story is called War Years. It’s the only autobiographical short story I’ve ever written. It’s about a little boy growing up in San Jose California, where I grew up, and his parents own a Vietnamese grocery store, which my parents did. Half the story is autobiographical. My mother told me an anecdote about someone who came to our store asking for money for this cause to go back to Vietnam and liberate the country. Viet Nguyen: I grew up aware of that, because in San Jose during the 80s, at the dead celebrations, the veterans would come out in their military uniforms, and there was a display at these dead celebrations showing men in uniforms in a jungle somewhere, and the point was there is a guerrilla movement out there trying to take the country back. I never forgot that, and that became part of the basis for The Sympathizer. Viet Nguyen: I took that anecdote that my mother told me, and put it into the story, and then I wrote the other half of the story that’s pure fictional. I grew up feeling that the community was actually not divided. The community was totally unified around this anti communist cause. In fact, it was basically the religion of the community, the secular religion that we are deeply anti communist, and we are gonna take our country back. Viet Nguyen: What has happened in the last few decades of course is that part of the community has hung onto that anticommunism very very strongly, for example in little Saigon, but also in San Jose, and yet at the same time the community has changed. There are more and more younger people who are not as invested in anticommunism. We have more and more people coming directly from Vietnam to this country as immigrants, and as international students who are not necessarily as fervently anti communist. These divisions, and we have people who go back to Vietnam to start businesses, and who are very pragmatic about the relationship to the country. Viet Nguyen: I’m an insider and sometimes I scratch my head, I’m like, “What’s happening?” The last big anticommunist issue in San Jose was about whether to name the Vietnamese-American business district, Little Saigon or Vietnam Town. I think that was the debate. People went crazy over this issue. If you pick one name or the other and I don’t know which one is which, you are a communist. I was like, “Why?” People were really invested in that. This is still the politics of the communities themselves, especially in California. Mai Elliot: You mentioned earlier that not every refugee who came here became a model immigrant. I was in Little Saigon last week and I was surprised to see homeless people, beggars, homeless people. We talk about the need to move on. Another need is to assimilate to American culture, it’s practically an economic necessity. You have to learn the language, you have to learn the way of doing things, the way of thinking, a new culture. Yet that leads to the question of identity, who am I? How much am I American? How much am I still Vietnamese? Mai Elliot: Parents go through this phase of assimilating and trying to hang on to Vietnamese values, Vietnamese traditions. Outside of the home they are Americans, but inside they are still Vietnamese. Viet Nguyen: We were very Vietnamese. It was really interesting because when I was growing up my parents would always tell me, “You are 100% Vietnamese.” Which made me wonder, we are from north Vietnam and we have some Chinese in us. I’m not sure. Why are we protesting so vigorously this idea? You are 100% Vietnamese. Viet Nguyen: Okay, fine. Then they become citizens, and they change their names. I’m like, “What happened here?” Then they asked me, “Do you wanna change your name?” I thought about it. I went through various names in my head. I thought, Troy. That was the one name I remember. He laughed, it’s ridiculous. I grew up as an American. I totally grew up as an American, and yet I could not bring myself to change my name when I had the opportunity to do so. Viet Nguyen: It’s different. I grew up very conflicted about this, because as I’ve said, I was an American in my parents’ Vietnamese household, but outside in the rest of the country I was a Vietnamese. I still meet people today, so many young people who tell me, “I feel conflicted.” Vietnamese-Americans but also Asian-Americans, or other people from mixed backgrounds. Viet Nguyen: We have to embrace the division, we have to embrace the contradiction. That’s very hard for people to do. Obviously people want to feel whole. They don’t want to feel conflicted. If I was a happier person I would want that too, but I’m a writer. I wanna feel conflicted or I don’t have nothing to write about. I embraced the conflict, I embraced the contradiction, but I think we all should, because it’s not gonna go away. As long as we live in a racist country, which we will, and we will, the contradictions will not go away. We have to embrace it and we have to not think about our identities as a problem but as an opportunity. Mai Elliot: Yes. Well, I grew up during the colonial era in Vietnam. I went to French school, I had to speak French, but when I came home I was part of a traditional Vietnamese family. I was always comfortable with that. I could separate my two selves, I’m French when I’m in school but I’m completely Vietnamese when I’m home. Mai Elliot: I grew up feeling that way. Viet Nguyen: Do you think that was possible because Vietnam was still your country? Viet Nguyen: I mean, in Vietnam you were Vietnamese. Mai Elliot: Yes, exactly. And everybody around me was Vietnamese, and I was still immersed in Vietnamese culture. Viet Nguyen: Then when you came here did you have a conflict? Did you have any sense of division or tension or anything like that? Mai Elliot: No, but I felt disoriented at first. That’s another issue I want to talk to you about is this sense of dislocation when you’ve first arrived in a foreign country, dealing with a foreign culture, a different language. I had learned English from a French teacher who taught me the British accent, French which is combined. Mai Elliot: I felt disoriented. I remember that when my family fled here my father was completely disoriented. He could speak French, but he couldn’t speak English, and he couldn’t wait to get to Paris. Did your parents go through that sense of dislocation too? Viet Nguyen: I think it’s interesting with the generational difference. I think if you come as an adult you already have your identity. You know exactly who you are. You are Vietnamese for example. When you come here and people treat you like a foreigner you like, “Well, I am a foreigner. That’s the way it is.” There is disorientation because your entire world has shifted. All the privileges that you had as a Vietnamese person Vietnam have vanished here in this country. That’s enormously painful and all that. Viet Nguyen: That’s a different experience than the younger generation that was raised here or born here. We don’t necessarily feel disorientation. We feel division, we feel conflict, because again we grow up feeling like we are American, but we live in a society that tell us we are not American. At least I was feeling like I was getting this signal from American society. Viet Nguyen: When I look at my parents, first of all I would have to talk to my parents to know for sure whether they have a sense of dislocation. For me, it always seemed as if they were not dislocated, but maybe they were dislocated and the way that they dealt with it was to affirm very strongly who they were, especially to me, and to the family. My parents are Vietnamese Catholics. If you know anything about Catholics, you know they are very hierarchical and very devout. If you know anything about Vietnamese people you know we very hierarchical, and very devout. Viet Nguyen: Then you cross the two with Vietnamese Catholics, and you’ve got super devout, super hierarchical people who know exactly who they are, and are willing to be models for the cause. That’s our role in Vietnam. We feel persecuted, and we are willing to be sacrificed and to sacrifice ourselves. I think probably they feel intense disorientation but their response to that was, we got to work harder, we have to suffer more, we have to sacrifice more. Viet Nguyen: That was their response. Their response was to work 12 to 14 hours a day to overcome this disorientation to make sure that they would never be disoriented again. That was their response. That was what I absorbed growing up. That really screwed me up. Anyway, that’s another issue. Again, I’m thankful for it because it made me a writer. Mai Elliot: Exactly. Writers like these conflicts and these questions about your identity and doubts, and so on. Mai Elliot: This assimilation can lead to alienation between the two generations. Can you talk about that issue of assimilation of the younger generation? Alienation from their parents who are not as attuned to American culture? Viet Nguyen: All that stuff you read is completely autobiographical. Mai Elliot: So it was you? Viet Nguyen: It was me, it was completely autobiographical. That grocery store, the New Saigon Mini Market that my parents started, that saved our lives, because that was how we got ahead in this country. In order to save our lives through that market, my parents almost had to sacrifice themselves at that store. It’s a typical refugee and immigrant story. This is what you got to do. Viet Nguyen: Even now it’s painful for me to talk about, because that store was where I have to go. Sometimes I have to work there afterwards, I could see how much my parents suffered working there and getting shot in that store, and all these kinds of things. I didn’t wanna be there. I did not want to be in that store. My parents, bless them, did not want me to be there too. They tried to save me from that as much as possible. Viet Nguyen: They were oriented purely towards survival. For them survival meant work and religion. Survival meant survival for our family, but also survival for the Vietnamese relatives that we left behind. Much of what they suffered was in order to make money enough to send back to the people in Vietnam, because we had left almost everybody behind and they were starving, the 80s were a bad time in Vietnam. Viet Nguyen: I knew all of that, I was very conscious of all of that. I was very conscious of the fact that my parents would be boxing up these fancy boombox stereos in order to ship them back to Vietnam so that the relatives could sell them to live. For me assimilation meant getting the hell out of that store. Getting out of San Jose, because I just associated San Jose with suffering, especially for the Vietnamese community, and I didn’t want anything to do with it. Viet Nguyen: What I had to do was in college get over this binary of either I’m gonna be in the store, I’m gonna be out of the store. I’m gonna be in the Vietnamese community, I’m gonna be out of the Vietnamese community. If you accept that binary you lose. It means you have to leave behind your community, you have to leave behind your parents and stuff. For me, the worst day of my life was going to Berkeley, because going to Berkeley was like getting hit by intellectual lightening, and all of a sudden I was electrified. Viet Nguyen: I took Asian-American studies classes there. I was like, “What are you telling me? That there was the Chinese exclusion act? That there was Japanese American internment? That there wasn’t just the Vietnam War, there was the Korean-American war, and the Philippine-American war?” All of a sudden I had the history that allowed me to make sense out of my parents’ store, and out of Vietnam War. I wrote several thesis on the Vietnam War. Viet Nguyen: I wrote a thesis on Edward Said and Graham Greene in the The Quiet American. That taught me a lot, and would feed them to The Sympathizer. I wrote a whole thesis on Vietnamese women’s writing. I was desperately trying to make sense out of my life intellectually and politically so that I wouldn’t be forced to choose. That i wouldn’t feel that assimilation meant leaving my parents behind. Viet Nguyen: My goal was to forge an identity for myself that wasn’t about assimilation, but was something more militant about being Asian-American so that I could fuse all these things together. That was the journey that would eventually lead me to writing The Refugees and The Sympathizer. That I wanted to redefine this history on my terms, and to talk about American culture, and Vietnamese culture and history on my terms, and not on the terms of assimilation, which was I think the signal that was being sent to me as a young boy growing up in San Jose. Either be Vietnamese, or be American, but you can’t be both. Mai Elliot: You talk about discovering the other side of America. I remember, when I grew up in Saigon I watched a lot of Hollywood movies. I pictured America as this paradise and so on. When I came to America I went to Georgetown. My first trip to the south, just across the ridge into Virginia, I discovered another American segregation. Viet Nguyen: What year was this? Mai Elliot: 1960. America was still very segregated, whites only bathrooms, restaurants, and so on. Viet Nguyen: I think that that’s like a forgotten history because for example my father in law was a paratrooper and he was in Fort Benning in the 1950s, and so he saw some of this stuff going on as well. There were all these Vietnamese people here before 1975 who were for military reasons and for studying, and for diplomacy and all that. We sort of don’t know as much about what that time was like. I’m very deeply curious about that, because we only talk about Vietnamese-Americans after 75. You are part of a generation that saw a completely different world. Mai Elliot: The sense of alienation, you actually talk about it in one of your stories. It’s the father who was developing Alzheimer’s, and the couple, he and his wife had six children, and yet they never came to visit them except for one. This one who comes to visit rarely spends more time working out in the gym, and then coming to see his parents. Mai Elliot: Assimilation can lead to dilution of family bonds, family values, because in Vietnam the family is everything. It’s the center of your universe, and yet in this story this couple is practically abandoned by their children. Viet Nguyen: It’s absolutely true what you are saying, family is fundamental and the dream is that three generations will live under one roof and all of that. I certainly know families like that. I know close-knit Vietnamese families and all that. I’ve also known and seen and heard of Vietnamese families that are totally fractured, either by the trauma of the war, or by assimilation, or because people just did bad things, abandoned their families for example, had wives in Vietnam and wives here in the United States. All this was part of vietnamese-American war. Viet Nguyen: In writing The Refugees, what was important for me was not to treat the Vietnamese refugee community or Vietnamese-American community as if it was homogenous, as if we could all be defined by certain kinds of cultural ideas. Like, yes, all Vietnamese people are filial. Viet Nguyen: Well, I mean, Vietnamese culture is filial, but there are plenty of non-filial Vietnamese people for example. What I wanted to do in this book was to say, “Yes, we are Vietnamese. We have this thing in common.” If you say someone is Vietnamese, it means no more than to say someone is American. Viet Nguyen: You look at the American literature, you don’t expect the American literature to say only one thing about one population. You expect a vast diversity of voices and experiences. And that’s what I wanted to do in The Refugees is to say, “Look, there are so many different kinds of people, so many different kinds of experiences. They extend from loving families to families that are not so loving, and that have been fractured and forced apart by history and by assimilation. Mai Elliot: Another theme you discuss is the expectations or excessive expectations. In one story, expectation not only from the parents towards the children, but also relatives in Vietnam, towards relatives who’ve made it to America, the land of plenty, the street is paved with gold, and relatives in Vietnam expect those who’ve made it here to be very successful. Mai Elliot: Vietnamese here at the beginning when they first came, those in Vietnam used to think that to be successful children have to be doctors or lawyers, or dentists, engineers. In one story, this woman Vivian, Vietnamese-American, goes back to Saigon, and her family has cultivated this aura of success and passing her off as a doctor. When she goes back to Vietnam she impresses her relatives with high spending habits and so on and so forth. Viet Nguyen: Well, when I was growing up in San Jose as a kid and as a teenager and feeling very alienated and everything. I didn’t realize at the time that what I needed were more voices, more stories about people like us, people like me, but they weren’t out there. There weren’t enough out there. If they were out there I didn’t know that they existed. Viet Nguyen: Looking back I can certainly think, “Well, yes, the reason we had this paucity of voices, whether they are Vietnamese or Asian-American, is partly because of racism. It’s also partly because of Asian parents. Asian parents out there, you got to do better. We can’t just say you have to be doctors, or lawyers or engineers. We have to acknowledge that we need our writers and our artists, and so many other different kinds of people. Viet Nguyen: I just wanna talk about that. Without our stories what are we? We are not gonna be a part of this country without our stories. We are not gonna be a part of Vietnam if that’s what we are concerned about without our stories too. That’s one of the reasons why I wanted to become a writer, because I knew the importance of storytelling. Viet Nguyen: I was lucky relatively that my parents, who were so conservative in almost every aspect of their lives somehow turned out to be liberal in this respect. I think what happened is that my brother went to college, and he became a doctor. That helped. Mai Elliot: He also went to Harvard. Viet Nguyen: He went to Harvard. I was like, “They are never gonna let this go.” I went to my last choice college, but my brother went to Harvard. Seven years after he came to this country, he goes to Harvard. It was an impossible standard. He was also a philosophy major. He did the other thing that you can do, which is to work twice as hard. So you are gonna be philosophy and pre med. Viet Nguyen: When I went to college he said, “Look here, you can be an English major, just tell mom and dad you are a premed too.” So I did, and I was actually a premed. I went to UC Riverside my freshman year, and I was in honors chemistry for example for 11 weeks. I know it was a quota system. I made it past one quota in the first week. I ended the first quota with a B Plus, which is not bad. It’s like an F for Asians, but nevertheless not bad. Viet Nguyen: The reason I got it was because of partial credit. I was like, “I understood nothing in this course and I still got a B Plus. God help my patients when I become a doctor at some point.” The 11th week I was sitting in an honors chemistry and I just thought, enough of this. I quit. I walked out and I never came back. Then I told my parents, “I’m gonna be pre-law.” That held them off for a few years. Viet Nguyen: In the back of my mind I really loved English. I thought, I loved studying the romantic poets, but there is no way I could go back to my parents who are working 12 to 14 hours day in a grocery store and say, “Mom and dad I really wanna study the romantic poets.” What changed for me was I also became an ethics studies major, I read Chicano literature, and Asian-American literature and African-American literature and I thought, “This matters.” This stuff matters. Stories are not just frivolous. They allow us to change our world and to imagine new possibilities. Viet Nguyen: I told my parents, “I’m gonna become a doctor of English.” Once I said doctor, they sat up and said, “English?” I’m like, “What?” Bless them, they just said, “Okay, fine. Do it. Your brother will finish his doctorate in four years. How long is it gonna take you?” I finished in five, because i had to get a job. That was the saving grace it was like, I’ll become a doctor of English, but I’m gonna get a job as a professor. Viet Nguyen: They never asked me what I did, they just said, “Fine, you have a job as professor. We don’t have to worry about you anymore.” I never told them I was gonna become a writer. That would just be going too far. I did that in secret. Viet Nguyen: I think the point is is that, we need more than doctors, and lawyers and engineers. We need them too of course, those are noble professions, but so is being a writer and a scholar. In Vietnamese being a scholar is a noble profession, right? Viet Nguyen: I think because of capitalism in Vietnam it no longer is, and because of capitalism here, and because of what this country is, we don’t respect our scholars here. Vietnamese culture has totally changed, here in the United States but in Vietnam as well. I think that’s just so sad that we no longer respect our scholars and our writers. Mai Elliot: Well, also science, medicine and law is okay because you become a great writer. Viet Nguyen: But you have to win the Pulitzer Prize. This is not fair. I wanna say you can become a writer and be a failure and it’s okay. You don’t have to become a writer and win the Pulitzer Prize. Although that made everything better with my parents. It was totally good. Mai Elliot: I have a friend whose son majored in history and she was so disappointed. The son eventually earned a PhD and taught history at Cornell, an Ivy League school, and the mother was still, every time I saw her she shook her head. She was so disappointed. You are right, Asian parents can be a real pain. How much time do we have? Female: We got five more minutes. Mai Elliot: Let’s see. What else can I ask you? There is so many questions. Your story, you paint such a large canvas. You capture a Hispanic immigrant, but you also talk in one story, you talk about the feeling of guilt between two generations of Americans. The father who was a B-52 pilot dropping bombs in Vietnam, and the daughter who feels a sense of guilt over what her father has done, and becomes in a sense a refugee herself, because she moves to Vietnam, and works to help the mines that are still maiming and killing Vietnamese. Mai Elliot: Can you talk about the sense of guilt that pervades, not just Vietnamese-American, but also for maybe losing the country? Also the sense of guilt among different generations of Americans. Viet Nguyen: That story is called the Americans, the bomber pilot is actually African-American bomber pilot. Part of what I wanted in The Refugees was not only talk about Vietnamese people, because it’s not as though Vietnamese people only hang around Vietnamese people all the time. We do know other folks … The collection actually has other characters who are not Vietnamese, and this is one of them. Viet Nguyen: I wanted to write that story, partly because I wanted to talk about people who are not Vietnamese, and which would mean not just talking about white people but talking about other kinds of Americans. There is one story about a Latino character in Orange County, and then another story about this black bomber pilot. Viet Nguyen: I wanted to talk about guilt and trauma. I didn’t wanna talk about the usual thing, which is to talk about the American foot soldier in Vietnam, and we’ve all seen these stories and heard these stories and so on, very important stories, but I wanna talk about a different kind of experience, which is obvious that all kinds of bombs were dropped on Vietnam, Laos and Cambodia, and so on. Viet Nguyen: The bomber pilots who did this didn’t necessarily feel guilty about doing that, because they never saw what they were doing. That to me is a very American experience. We like to drop bombs on people. That’s who we are. It doesn’t necessarily make us feel guilty as a country. That to me was interesting. I am deeply opposed to bombing. Viet Nguyen: It would not be a very interesting story if I just wrote a story where i just said, “This is terrible.” I wanted to try to get inside this pilot’s psychology and think about, “How would he deal with this? How would he feel about this?” To confront responsibility and to confront how someone deals with the past when he can’t even articulate it to himself. He never admits to himself his guilt or his culpability. He resists that. He thinks his daughter has become this crazy liberal for bringing this up. Viet Nguyen: That was why I wanted to deal with the very common mindset that we are not responsible. That what we have done is not wrong, and to try to understand how someone would live their life in that way. Viet Nguyen: After that. Okay. Viet Nguyen: Don’t do it. Mai Elliot: Online that I checked, you said that you started writing short stories, but your agent told you that that there is no money to be made writing short stories, and advised you to write a full length novel. Would you still advise people to start small and write short stories before writing a full length novel, or do whatever inspires you? Viet Nguyen: There is a complicated formula for how he’s gonna do this. I sat there, I did averages, I looked over in the past 20 years and I think, I’ve probably spent about, at least on fiction about 10,000 hours as Malcolm Gladwell says you got to do. He’s kind of sort of right. 10,000 hours. That’s one thing if you are in the northeast and it’s freezing and cold and you wanna spend time indoors, but I’m in California. I spent 10,000 hours in a room, most of the 10,000 hours I was just looking at a blank white wall. That’s what it means to be a writer. To sit by yourself for that long, and to go into yourself. That’s the only resource that you have. Viet Nguyen: I thought, “How do I do that?” If it’s just a matter of physically cutting things off, not a problem. But for a writer it’s like looking inside of yourself and going into the places where it hurts, which most sensible people don’t wanna do. As a writer that’s your resource. The pain that you feel is the pain that you have to tap into in order to give that pain to your characters, whatever feeling that your characters have to have. You have to find it within inside of yourself. Viet Nguyen: I think that is half of what it takes to be a writer. The other half is the technical stuff. The technical stuff, how do you write a story? How do you craft a scene, how do you plot a novel? That’s important too. Books and classes can teach you that. Books and classes and teachers can’t teach you how to go inside of yourself. Viet Nguyen: I took some classes but mostly it was me teaching myself over the course of 20 years, that’s how long it took me to become a writer. I came to southern California in 97 with my PhD. I was gonna start teaching at USC in August. I came to LA in May or something. I thought, “I have a summer. I’m gonna write a short story collection. It should be easy. They are just short stories.” It took me 20 years to publish that short story collection. That’s how long it took me to become a writer. Viet Nguyen: It was because I faced myself and endured all those rejections and all that solitude that I became a writer. How you do it is your own individual path. Some of you will take longer, some of you will take shorter. Some of you would choose the right poetry, some of you would choose the right short fiction. Some of you would choose the right novels or memoirs or nonfiction. It doesn’t really matter what path you choose. They are all equally hard. Viet Nguyen: Just because something is shorter doesn’t mean it’s easier. I started off writing poetry. I thought, “Uh, poetry.” Poetry was harder than writing short stories. So I stopped being a poet, then I wrote short stories. I started off writing short stories because I thought they are short. They must be easier than writing a novel, I will train myself by writing short stories. It took me 20 years. Viet Nguyen: Then ironically when it came time to writing The Sympathizer because my agent told me to, it only took two years, because by that time I’d spent 17 years banging my head against the wall writing short stories, and I had actually learned something, and I was able to make that breakthrough. I wish for all of you who wanna be writers that you’ll reach that moment of breakthrough. In order to break through you have to work enormously hard to do it at the same time. Mai Elliot: Thank you very much. Viet Nguyen: Maybe we can take a question from here in the second row, this gentleman in a sweatshirt. Male: Hi, before you were published. How did you face the doubts about your own work? Especially since this is so important to you, how did you face the doubt that people would want to read, and that it would be published? Viet Nguyen: Well, I think that’s part of the definition of the difficult of being a writer is just anxiety about, number one, am I good enough? All writers deal with that. Number two, will I get published? Will anybody else care? Viet Nguyen: There was no way to deal with it except just to have faith that it was gonna be worth it, and to feel like I had no choice. I was stubborn. Even with all the rejections I was still stubborn. Even when I got a success, for example getting a short story published. I would realize no one cared. No one cared when I didn’t get a short story published, and no one cared when I did get a short story published. No one cared. Viet Nguyen: No one read it before it got published, and then after it got published maybe 10 people read it. What I’m trying to say is that everybody has to go through this ordeal to build self confidence and have faith in her or his own capacity, or his own vision. I had to believe that what I had to say was worthwhile. Viet Nguyen: We have to find that strength within ourselves to do that. That was how I became a writer to endure it long enough, so that at a certain point it was no longer important to me whether anybody else read my work. I think I like many other aspiring writers wanted approval from agents and editors and publishers, and ultimately leaders, but that’s the wrong approval. Viet Nguyen: Of course it’s nice to get that and we won’t get published without that. In the end I reached a certain point after about 17 years, and I had published some stories, where I thought, “I don’t care anymore whether anybody else likes my work. I’m gonna write for me.” That was the breakthrough, that was the moment of liberation. I’ve heard that from so many writers that that was what was really crucial is to finally dispel from your shoulder this anxiety about having someone else read and care about it, and to ultimately understand that you had to please yourself first, that you are the first audience. Every writer has to get to that point. Viet Nguyen: You have a microphone or two, maybe someone over there. Female: Thank you both very much. We have for about three years have a refugee resettlement group here called The Newcomers Access Center [inaudible 00:59:41]. What would you say, maybe each of you can answer to the many volunteers, what’s the best thing the volunteers can do to help folks? Mai Elliot: Let me think. The reason I’m hesitating is my family came here, they got sponsored. They got jobs, and menial jobs like you talk about at first. I would say that probably the best thing would be to understand what the person has gone through, and then find out what needs this person has, not just material needs, jobs and so on, but psychological needs. Then just basic things to help this person get on his or her feet, English language training, training in American culture, how do you go about doing things? Things like that. I think that would be very helpful. Mai Elliot: Of course, maintaining the hope that life will get better, if not for them then for their children. I think hope is something very important to keep a person who has lost everything to keep going. I remember for my family that was the one thing that kept us going. Every time we lost everything, it was the hope that things would look up in the end that kept us going. Can you add to that? Viet Nguyen: I mean, besides all that, which is all obviously very important. I think of the work that people do with refugees now, with the work that people did with us as refugees 40, 50 years ago. I think that those people who helped us back then had no idea what was gonna happen in the future. Neither did we. And yet, 40 or 50 years later, what’s happened with the Vietnamese refugee community is that with all the ups and downs, and the unevenness, some people have succeeded, some people have not. The community has become firmly established here. Viet Nguyen: It’s a success story in that sense, not because we became doctors, and lawyers or engineers, but because we formed a community here, and we have supported and nurtured each other. I think that people who helped us out 40 or 50 years ago must look at that and feel that they’ve done the work. Their work was so crucial. But they would not have known that for so long. I think that’s what’s happening now. For people who are helping refugees now it’s to understand that it’s going to pay off. It’s just gonna pay off 10 or 20 or 30 years down the road. Viet Nguyen: It’s the same kind of work that we do as teachers. We teach and we think we’ll never know what happens to our students. Well, if we do know it won’t be for another 10, 20 or 30 years when someone comes back and says something to us. That’s what’s gonna happen with refugees as well. Male: At the end of your book you had some papers included that you had written. One of them about refugees and how perhaps the Vietnamese refugees differ from other refugees, perhaps maybe because of guilt on the part of America, and sympathy for refugees when the Vietnamese came, but how differently they are treated now from let’s say the ones from America, and how it’s a radically different culture now they are facing? Do you want to explore that further? Viet Nguyen: The instigation for that was that we are now living in a refugee world. There are refugee waves coming at the United States, coming at Europe. People feel there is a sense of crisis. Obviously The Refugees feel they are in crisis, but Europeans and Americans feel that they are in a crisis too. There is a huge debate about whether to take in refugees or not, or how many numbers and so on. The instigation for me was that there were some former Vietnamese refugees who were saying, “No, we shouldn’t take in any more refugees, because we Vietnamese refugees were the good refugees. These new refugees are the bad refugees, because they are Latino for example, or they are muslim,” and so on. Viet Nguyen: I grew up in this Vietnamese refugee community of the 1980s in San Jose and let me tell you, there were a lot of bad Vietnamese refugees who did a lot of bad things. The very language of good and bad is irrelevant. It’s a moralistic language that people accept. We should dispose off that language of good or bad refugees, but more to the point for the Vietnamese refugees who are saying this, they don’t understand that we were not the good refugees, we were the lucky refugees, because it was to the advantage of the United States to take in refugees fleeing from a newly communist country, as evidence of how great the United States and capitalism were. Viet Nguyen: Now the circumstances have changed, because now there is no benefit for the United States to say, “Hey, we are gonna take in refugees from Latin-America or dominantly Islamic countries.” There is less sympathy for these refugees. There is less guilt on the part of Americans, because Americans don’t see their relationship to what is going on either in the Middle East or Latin-America. Viet Nguyen: Americans could see a very direct responsibility to what happened in southeast Asia for obvious reasons, but they don’t see it with what’s happening now, even though we do have a hand in the Middle East, and we do have a hand in Latin-America. There is so much more work that needs to be done for those of us who are advocates for refugees to say, “Look, we have to tell the story. We have to narrate this situation so that Americans can see their responsibility.” We would hope that we would feel human responsibility just generally, but we have historical responsibilities to these countries and to these people who are coming. That’s what I want to try to do with that from the back of the book and from other things that I’m writing as well. Male: Thank you both for teaching us in this really like a master class in humanity. Thank you for all the teachers. I know they are many. Male: I wanted to take it a slight different direction, you mentioned your son, it sounds like he’s five or six. What are you looking forward to reading to him down the line? What are books that you think will really help him navigate his life? Viet Nguyen: It’s really interesting being a father of a son, because I haven’t read children’s literature since I was a child. Now I’m in all kinds of children’s literature and realizing things have changed for the better. I’ll give you my son for example, I loved Curious George when I was growing up so I gave him Curious George, it’s clear, Curious George is a colonizer’s book. Viet Nguyen: Yes he loves curious George too, but I’m so thankful he has other options out there written by artists like, of our generation for example who have grown up in a multicultural era, in a decolonizing era, where we don’t have to turn to some of these kinds of images. I’m actually learning from what he’s choosing. Dog Man is an awesome book. Dog Man, I think that I wanna read him stuff that I think is important, but I’m also trying to learn from what he’s being exposed to as well. I’m also trying to walk the walk when it comes to being that Asian parent. Yes, I’m forcing him to take piano lessons for example, sending him to French school. Viet Nguyen: I said, “Yes.” They said, “Can we publish it?” I said, “Yes.” I took his story, because it’s a crazy story, I could never have imagined it myself. I put a narration on it, and then Tibui and his 12 year old son are illustrating it. That’s what to me is actually crucial, he’s written his own book. I went to his kindergarten class yesterday and I presented that book. I was very terrified, I was like, “I got to impress these five year olds.” They laughed thankfully. They enjoyed the book. Viet Nguyen: Yes. That’s my answer to the question. We got to read to our children. We also have to encourage them to become writers and artists. Even if they are not doing that in terms of ever becoming professionals. They need to tell their own stories. I think that’s just as important as reading books, but I do read to him every day as well. Female: All right. First off, thank you so much to you both for coming here. It’s really refreshing to be able to have this perspective, especially here at the colleges. I’ve just recently finished reading The Sympathizer, which was fantastic by the way. I was really struck by the different perspectives, and the different types of criticism that you have for everyone across the board from communist, anti communist, Vietnamese-Americans to Vietnamese residing in Vietnam. Female: With that being said, I think I have a two pronged question. The first is, what led you to go in that direction within the story? Then second of all, what has been the reception that you’ve received by Vietnamese Americans, and especially Vietnamese residing in Vietnam with these stories that you’ve told about them? Viet Nguyen: Well, I just emailed my publisher in Vietnam and I said, “What’s happening with The Sympathizer?” The transition was done last year. She says, “We are just trying to find some publishing company that will give us permission to publish it.” I said, “It’s politics, right?” She says, “No, I think we are problems.” I’m like, “It’s politics.” Because what happened with The Sympathizer was that I wanted to fully confront what I thought of as the tragedy of Vietnamese history, which is that every side lost something. Viet Nguyen: Every side believed that they were doing the right thing. Everybody believed they were doing the right thing. Every side lost something in this war. I wasn’t interested in picking sides, I grew up in this refugee community where we were forced to pick a side, you were either with us or against us. We are the victims, we are the good people, the communists are evil. I didn’t see the world in that way. I grew up reading a lot about the Vietnam War, because I was fascinated by it, because I knew it shaped. Viet Nguyen: My ethical problem when I was growing up was imagining, what would I have done if I lived during that time period? I could make all kinds of judgements about people, but what would I have done if I had been there? That was the impetus for writing The Sympathizer was not to make judgements on people but to try to imagine what it would mean where everybody lost in this conflict? I wanted to create a character who would be right in the middle of history and right in the middle of all these conflictive choices. Viet Nguyen: I made them a spy, I made them a communist who was deeply in doubt eventually about communism. What that meant was that I wrote a book that didn’t please anybody. The Vietnamese community here in the United States … The Vietnamese government in Vietnam probably has problems with the book because it’s about a communist who has doubts about communism and shows that the communist party did something right, and then did something horrible in the years after the war. Viet Nguyen: That was the book I wanted to write, I wanted to write a book that offended everybody, because I had not seen that book yet. Every account that I had seen of the Vietnam War, almost every account chose a side, and chose to tell the war from one perspective. It was so deeply … Some of these books were very powerful but at the same time also unsatisfying to me. Again, that is a very common experience for a writer. We are unsatisfied with what we’ve read. Therefore we feel we have to write the book that we need to see. That was the genesis of The Sympathizer. Female: First, thank you so much for being here. I think it means a lot as a second generation Vietnamese-American. For both of you being part of really big projects the last few with talks in the Vietnamese community. How have you been able to use your experience with those projects to talk about the Vietnamese, Vietnamese-American experience with your families, with friends, and with people who are not as familiar with the trauma, and the Vietnamese-American experience. Mai Elliot: The question is? Viet Nguyen: How have you used your platform I guess as the language to talk about Vietnamese and Vietnamese-Americans to an American audience now that you’ve had the opportunity with the Ken Burns documentary and after Sacred Willow? Mai Elliot: Well, I’m sort of in the same route you are, because I start kind of in the middle of this conflict that is still dividing the Vietnamese community. Some people like it, some people hate it. Like I have offended both sides. The communists like some parts of it, they hate other parts of it. When I talk to the Vietnamese students that I’ve had for example at Irvine. I try to tell them to look at this objectively, because history is extremely complex, and like you said there are good guys and bad guys on both sides. Mai Elliot: I think it’s very crucial to approach this with an open mind, and don’t approach the recent history with preconceived notions as to which side did the right thing, and not the right thing, because they did wrong things and good things? That was my advice to the Vietnamese-Americans who came up to see me. When Ken Burns went on this promotion tour, he didn’t have time to show 10 episodes, 18 hours long. He only showed clips. I would tell them, “Just watch the whole thing with an open mind.” Come to your own conclusions at the end, because a film like Ken said he doesn’t want to put his thumb on the scale of history. He doesn’t want to take side, he tries to be as objective as possible, and presents the viewpoints of all sides in this very divisive conflict. Mai Elliot: That was my advice to them is to … I don’t want them to make up their minds beforehand, and just watch it and make their own conclusions, maybe talk to their parents and find out what happened from their perspective, because there are just so many perspectives when you look at this war. Viet Nguyen: I think my answer is twofold. I think that on the one hand, besides writing the books, and I’ve published three books in the last three years or four years, dealing with the Vietnam War in various angles, besides that, and I’ve written a bunch of op-eds, and magazine articles, and so on. Part of the effort there is to say that the history of the Vietnam War in this country has been defined mostly by Americans. It’s ironic obviously because it was mostly Southeast Asians. I mean, if you just wanna look at it quantitatively by any kind of metric, it was mostly Southeast Asians who paid the price in this war, and yet here in this country we are oriented towards the American perspective, which is fine, it’s the United States. Viet Nguyen: We can’t just be doctors and lawyers and engineers. Although that’s all very important. We also have to our artists, our writers, and our speakers, and our activists and our politicians, and people who will take a public stance, and a public role to transform the debate in this country so that we are at the center of the issues that concern us. Viet Nguyen: We want to be able to redefine our history of Vietnam and the Vietnam War, but we can’t only be allowed to speak on that issue. We have to be assertive and also say, “Look. We have so many other things that we can talk about as well.” That’s also what I’ve been trying to say in the op-eds and the magazine articles. That cover article for Time Magazine was exactly about that. It’s not just about Vietnam it’s about the entire country, and who we are as Americans, and that the Vietnamese are part of the United States now. We have a say too, we have a say now in this country as well. Female: One more question, one more. Female: Thanks. Thank you both for speaking today, and this question is for Professor Nguyen. There were like a couple “trends” that I think we’re big last year in 2018. On the one hand you had the rise of age representation in art and media, and on the other hand you had the rise or I guess resurgence of socialism in politics, and just like anticapitalist critiques in general. At the same that I read your book The Sympathizer I was also reading other books like Severance, by Ling Ma, who is Chinese-American, and Dear Cyborgs by Eugene who is Korean-American. Female: Those books also have very subtle, but super sharply observed critiques of capitalism, like fully at their foundation. It’s interesting because I think that in Asian-American communities, especially those that have been affected by or have complicated relationships with communism, there is this reluctance to critique capitalism as loudly or as fervently as is now becoming popular I think. I guess my question is, what do you see as the future or the challenges facing Asian-American writers specifically who want to look critically at capitalism, and who want to think imaginatively about other political futures, and incorporate that into their work? Viet Nguyen: That’s a really good question. It was always a lot on my mind, because for those of you who don’t know I did my dissertation and my first book on Asian-American literature, so I read a lot of it. I always very concerned about what the politics of the literature was, and what did writers feel that they could talk about. This is also true for Vietnamese-American literature as, a relatively more recent phenomenon. I think you are absolutely right that the sway of the immigrant and refugee narrative is very strong on Asian American and Vietnamese American literature, especially for the Vietnamese, we come here as refugees or immigrants, and we feel that we should be grateful to this country. Viet Nguyen: As I said in The Sympathizer, yes we are grateful to be rescued by Americans, but perhaps we wouldn’t need to be grateful if you hadn’t bombed us in the first place. It’s a complicated set of emotions. Yes, people I think have a hard time getting past the American dream part. Let me say this about the American dream. The American dream allows us to criticize America, that’s a part of the American dream. That’s what sets us off from communists for example. That’s the dilemma, right? Then you say, “Well, you can’t criticize it too much, because if you criticize it so much you just go back to where you came from. Viet Nguyen: Then a lot of I think Asian-American writers have backed off from more … There are a lot of radical critiques, but a lot of Asian-American writers have also backed off from radical critique, and that’s also especially true for Vietnamese-American writers, this reluctance to go too far. The American dream allows us to say things like, “Well, my parents were refugees and they had a horrible time working in a grocery store.” That’s part of the American dream. They suffered, they struggled, and then they became Americans. Viet Nguyen: I think what we are basically seeing in these trends that you are identifying is the fact that the long narrative of capitalist development in this country, which includes the Vietnam War as a capitalist war, or the war of capitalism versus communism. The long history is that we are still in the Vietnam War era phase. Capitalism was supposed to bring all these benefits to southeast Asia, into the United States, and it’s not working out that way. Viet Nguyen: Younger people I think who have not seen the benefits of capitalism that were seen by their parents’ generation for example, are legitimately concerned, about whether capitalism can deliver on its promises. I think we are gonna see more of these kinds of critiques. I don’t think we need encourage Asian-American writers, because there is less interest in simply telling the story about how, the classic Asian-American story about how it was awful in Asia, we came to the United States, we struggled through the immigrant experience, and now we are Americans. It’s awesome. Viet Nguyen: Now we are reaching the phase of disillusionment about the younger generation or the second generation experiences. I think it’s a good thing because it revitalizes the literature, because the tropes of the American dream and immigration, all that kind of stuff. They are tired. We need something else, and the younger writers are bringing something else. Thank you very much. Viet Nguyen: Thank you as well. [inaudible 01:24:01]. Female: We thank our speakers so much. Can we give them another hand. Thank you. Female: What we’d like you to do is just to stay and let them go up, take their water with them, and get settled in. Then if you will go up there are some books that are available for sale if you wish or if you have books. They will be up there to sell them, or to sign them for you. Thank you. Thank you for coming.